Fig. 1. 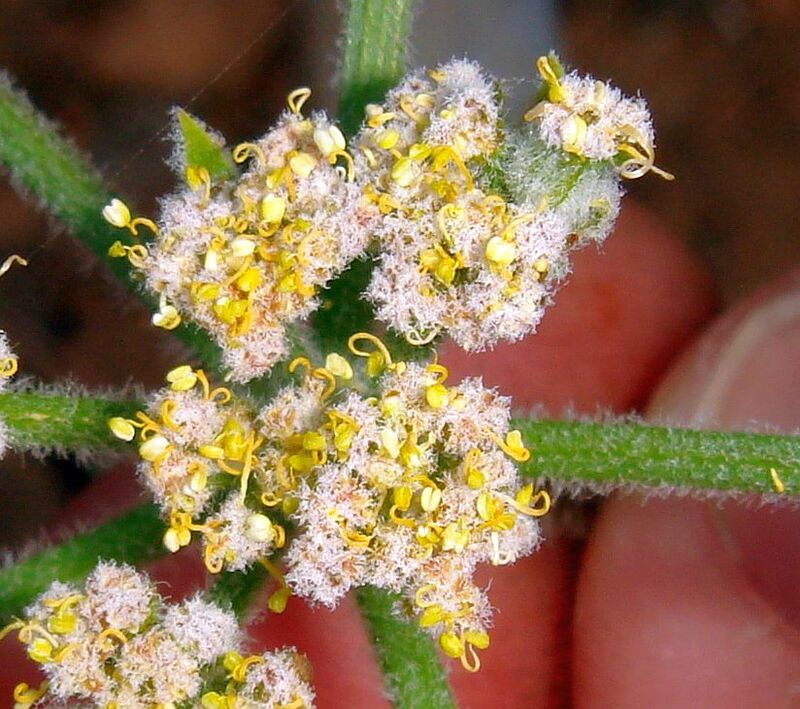 Left: Flowers of Lomatium dasycarpum from Cuyamaca Peak on 1 June 2013; note the dense white curly hairs on the petals. 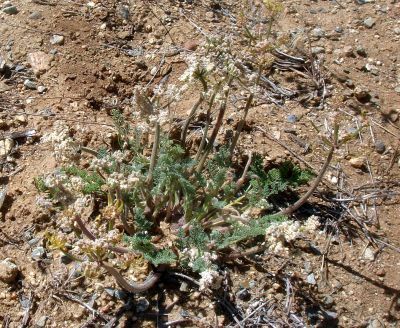 Right: Flowers of L. mohavense from Bobs Gap, just north of SnGb, on 3 April 2014; note the absence of hairs on the yellow / yellow-brownish petals (the green sepals have stiff straight white hairs; the petals are curled together in a ball). Click on the pictures for larger versions. Because in southern California we only have var. 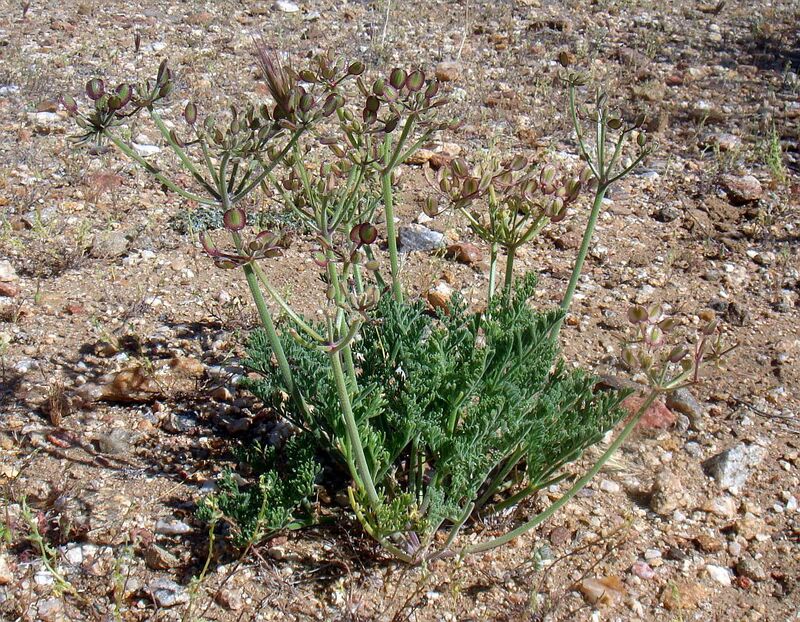 dasycarpum of Lomatium dasycarpum, I will simply refer to it as L. dasycarpum on this page. 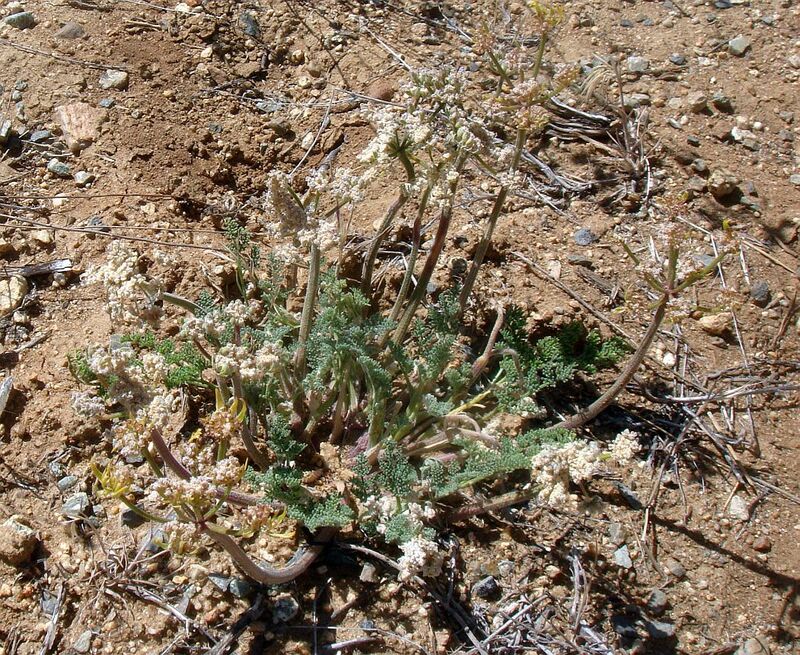 Although Lomatium dasycarpum and L. mohavense are very similar species in many respects, their petals are clearly different (Fig. 1) and they have nearly completely-separate geographic ranges (Fig. 2). 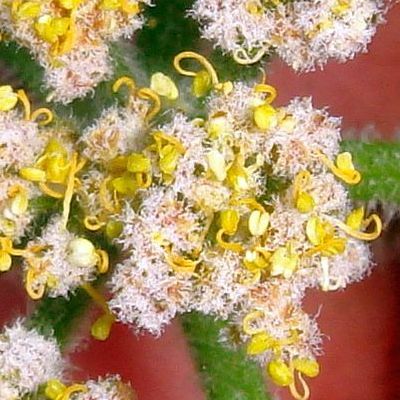 The petals of L. dasycarpum appear white due to dense white curly hairs on the outer surface. 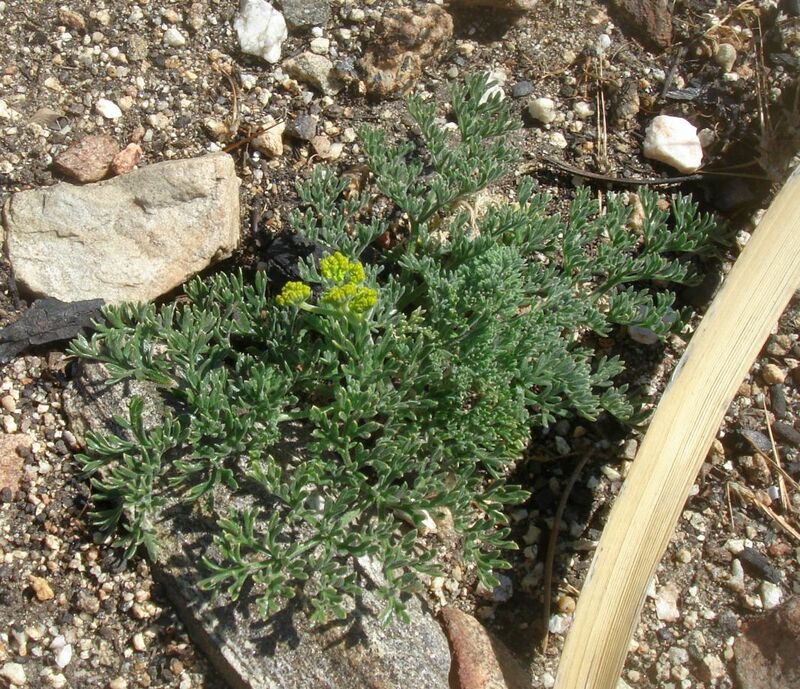 In contrast, the petals of L. mohavense have no hairs at all, and usually appear yellow in southern California, with some plants having petals with a brown / purple tinge and some plants, especially in the northern Mojave desert, having purple petals. 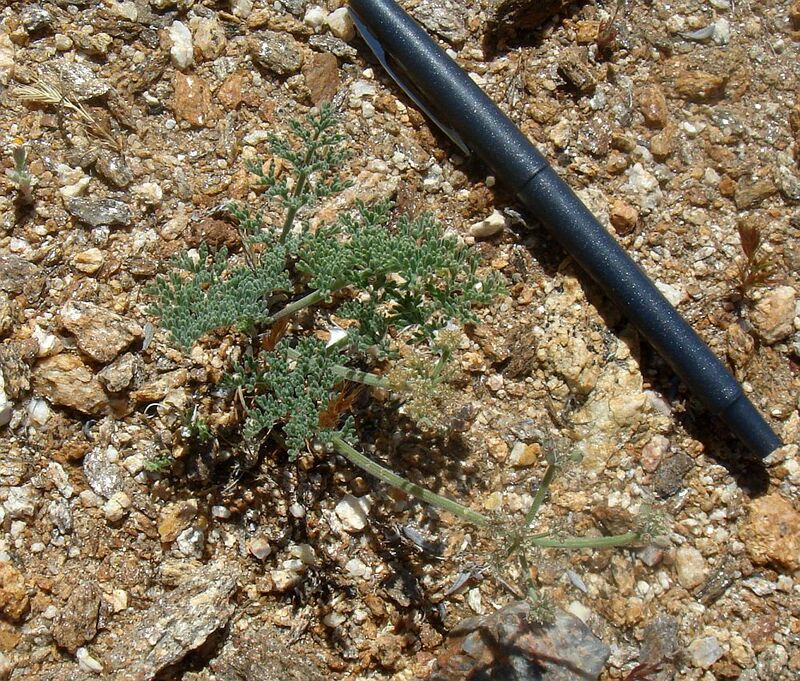 L. dasycarpum is mostly a cismontane species, found in the mountains of southern California west to the coast. 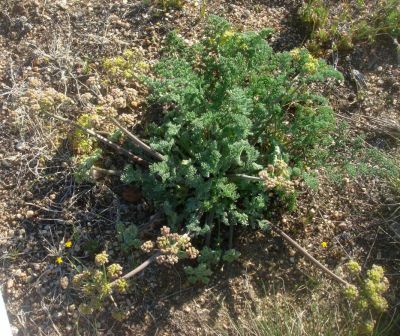 L. mohavense is mostly a desert species. 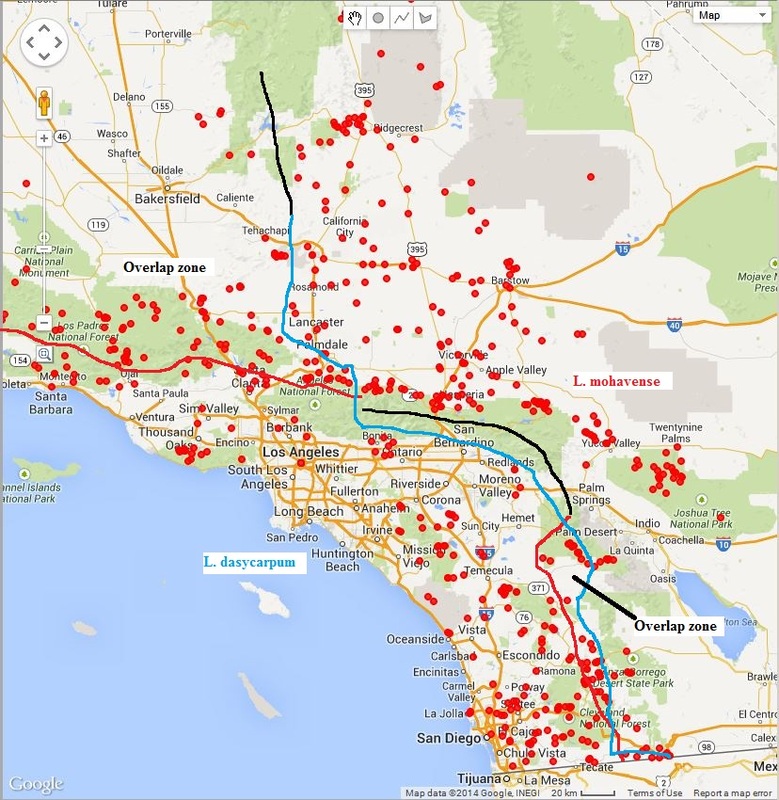 However, their ranges overlap in the eastern Peninsular Range (e PR) in Riverside and San Diego Counties, and in the Western Tranverse Ranges and Tehachapi Mountains. I created this page after being frustrated that I could not easily tell the difference between these two species in the eastern Peninsular Range without a close-up examination of the flower. 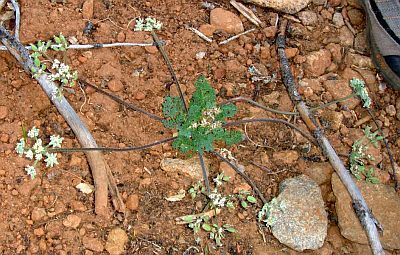 It turns out my frustration is because in this area it is indeed extremely difficult to distinguish these species without a flower. The pictures on this page document the variation within each species in southern California. Fig. 2 shows the geographic range of the two species from vouchers (see also voucher location maps for each species separately: L. dasycarpum and L. mohavense). A few erroneous locations for L. mohavense have been ignored in drawing the boundaries in Fig. 2. 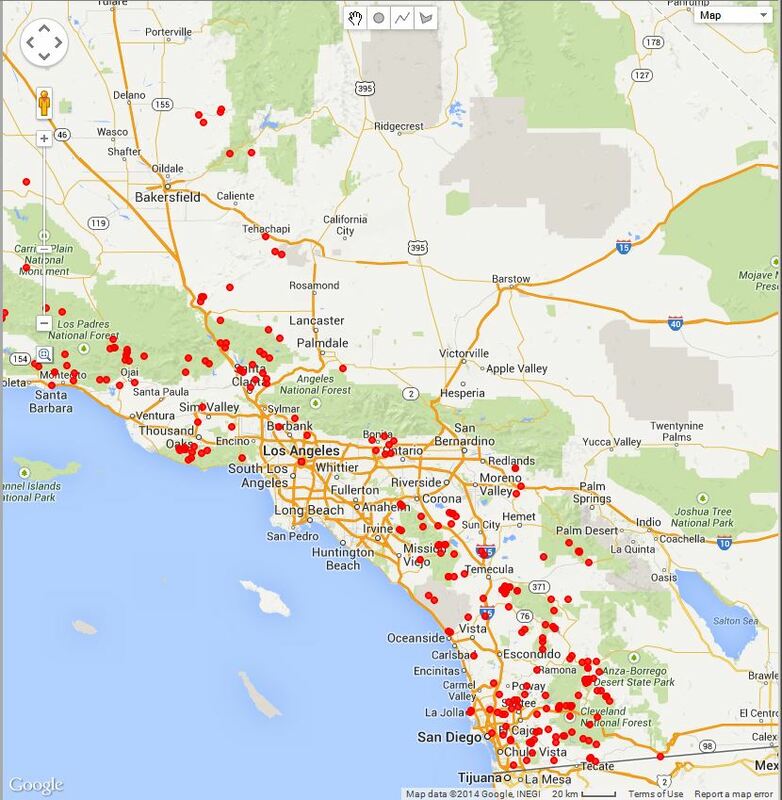 See also the voucher map from the San Diego County Plant Atlas site. Fig. 2. Voucher locations for L. dasycarpum and L. mohavense (click on the name for a map showing only its vouchers). The black line gives a dividing line where the species ranges do not overlap. In the overlap areas, the range of L. dasycarpum is west of the blue line and the range of L. mohavense is east of the red line. 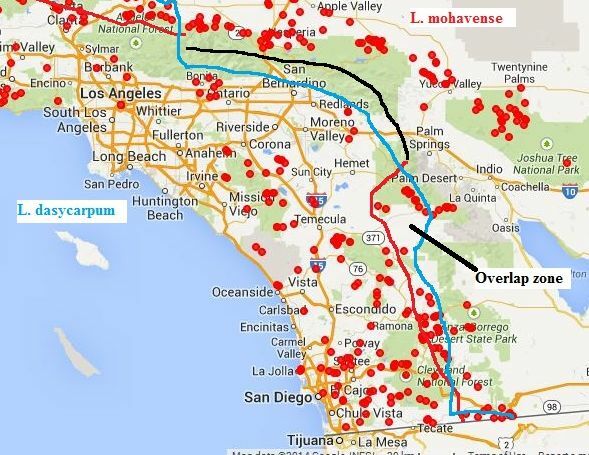 Click on the map for a version showing a larger area that shows a much larger overlap zone in the western Tranverse Range area. Fig. 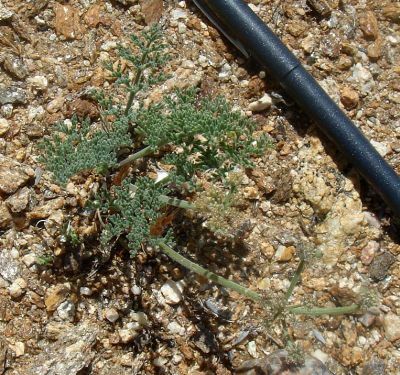 3 gives pictures of entire plants for each species that show how similar these two species are in overall appearance, as well as some of the variability in appearance. 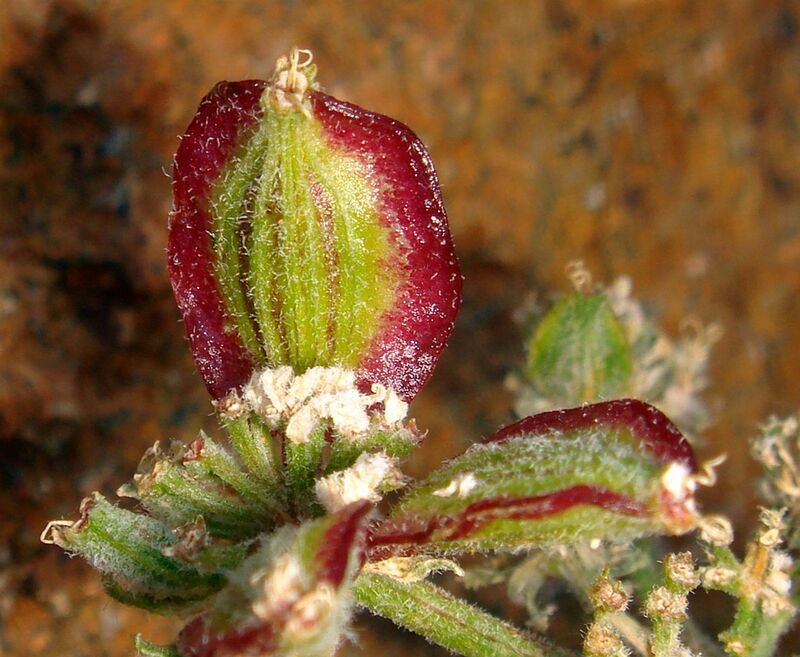 Note: The species determination of this plant is only from vouchers and surrounding plants; no petals were present. Fig. 3. 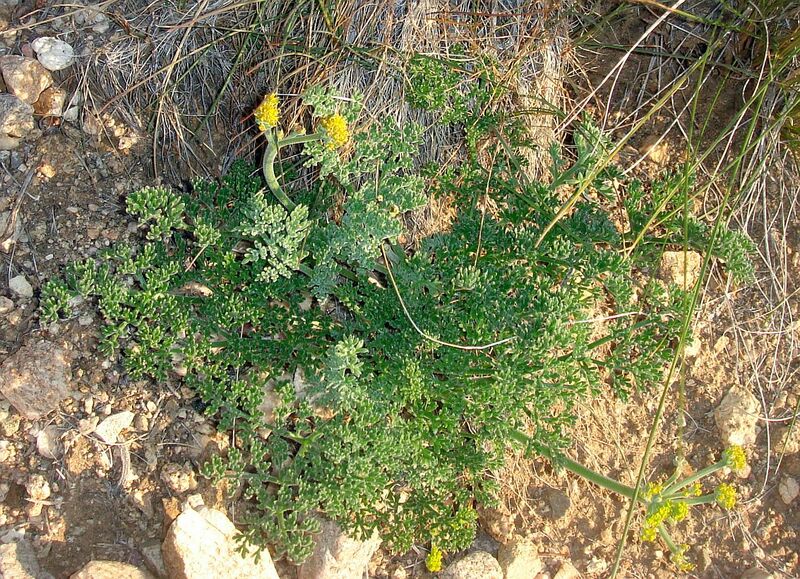 Left: entire plants of L. dasycarpum. Right: entire plants of L. mohavense. Click on the pictures for larger versions. 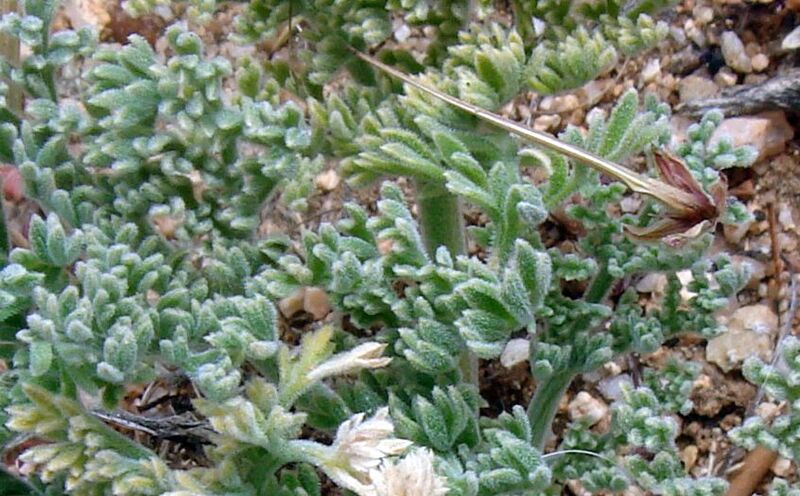 L. dasycarpum is said to generally have at least one cauline leaf, whereas there are no cauline leaves for L. mohavense. 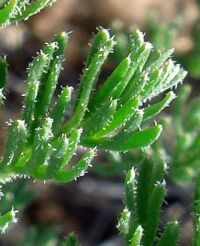 The leaf blade for L. dasycarpum is said to be 2-3 pinnate, and the leaf blade for L. mohavense is said to be 3-4 pinnate. 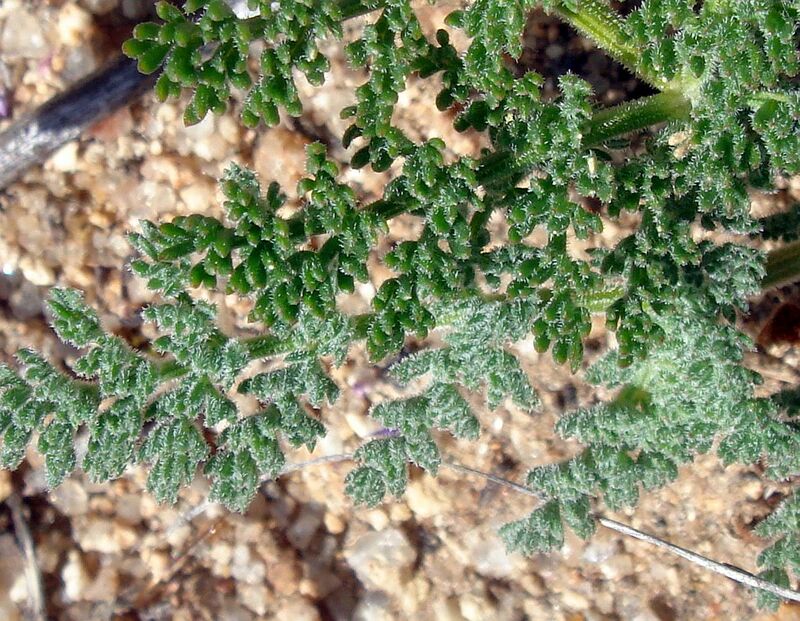 The ultimate leaf segments or divisions are linear for L. dasycarpum, and linear-oblong to obovate for L. mohavense. 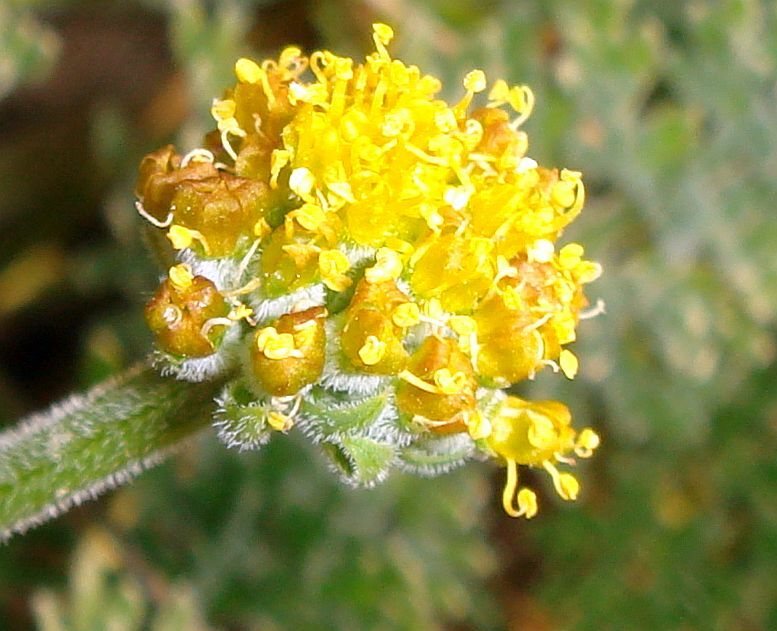 The petals for L. dasycarpum are ± green-white or ± purple, appearing white due to tomentose hairs; the petals for L. mohavense are yellow or purple, without any hairs. 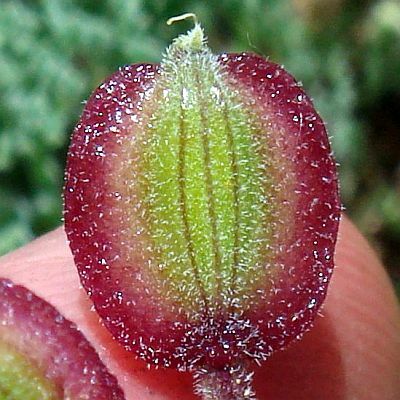 The fruit is sparsely hairy for L. dasycarpum, and ± glabrous to densely short-hairy for L. mohavense. 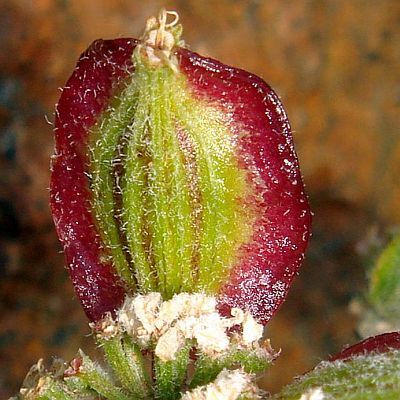 However, in the overlap zone for these species in the e PR, none of these unambiguously separate the species except for the hairs on the petals. 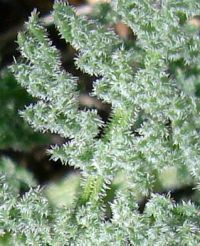 Keir Morse noticed that in my pictures of leaves from the e PR that the leaf hairs appear to be generally coarser and sparser for L. dasycarpum. 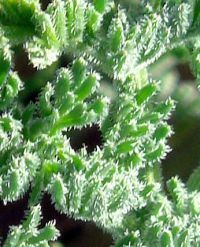 In particular, the hairs on the leaf rachis appear to be generally noticeably fewer for L. dasycarpum, and much less uniform around the rachis, although that is not always obviously the case. 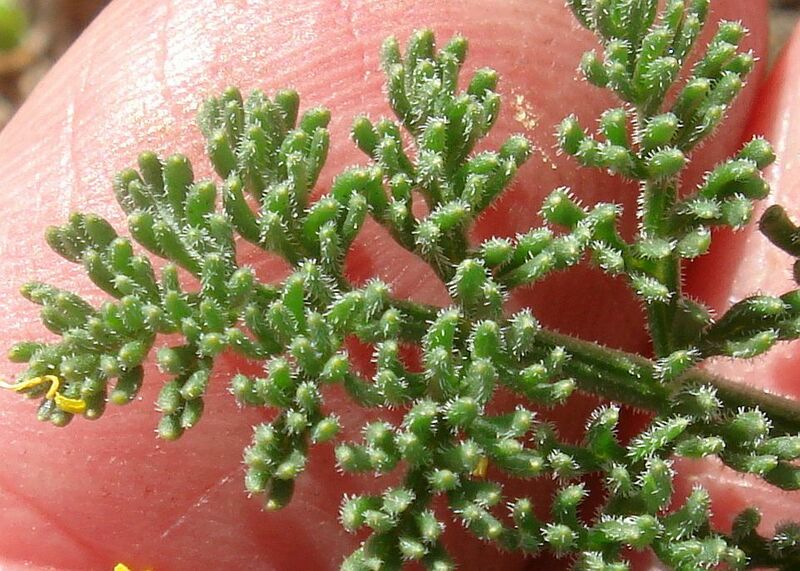 I then noticed that the hairs on L. dasycarpum also seem to be a bit wavy, like the hairs on its petals. 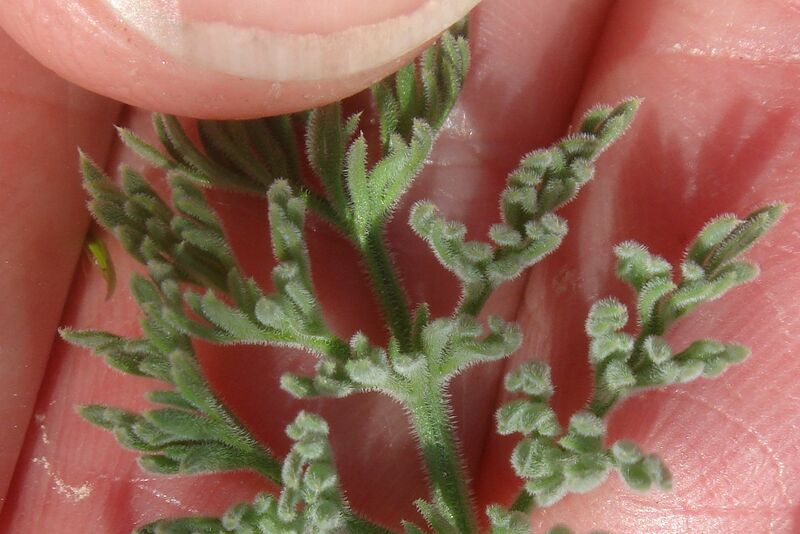 The difference in leaf hairs may be the most reliable characteristic to distinguish vegetative plants in the e PR. More study is needed to see how useful this characteristic is. 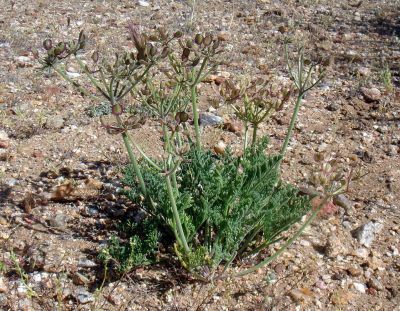 the general habit of the plant [seems different]. L. dasycarpum seems to have nice radial symmetry going on with its inflorescences oriented around the plant, whereas L. mohavense just seems to throw an inflorescence or few out in any direction. Looking at my pictures, and online pictures, this seems to be a fairly reliable distinction, albeit not an ironclad difference. 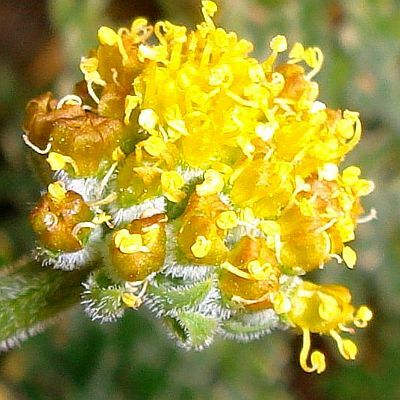 These characteristics are discussed individually below, except for the hairs on the petals which have been previously discussed. Cauline leaves. 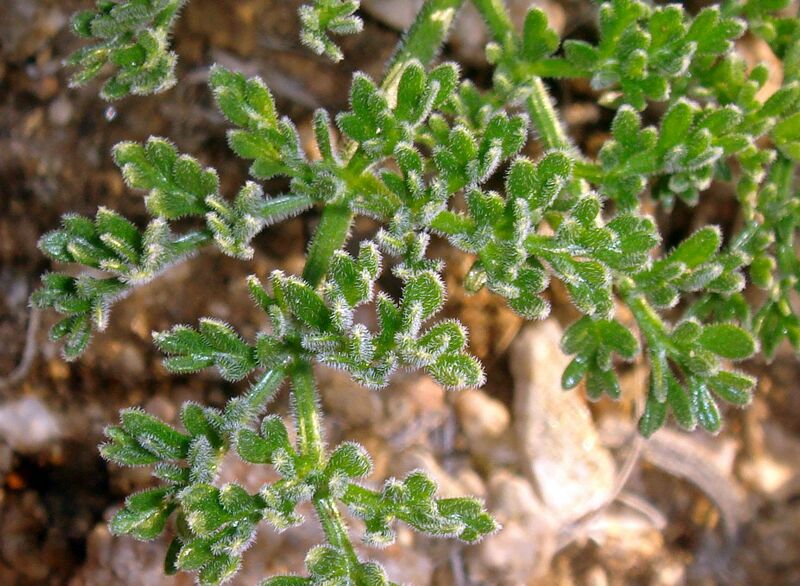 The key to separate these species in every flora is whether cauline leaves are present or not, with L. dasycarpum said to generally have at least one cauline leaf. 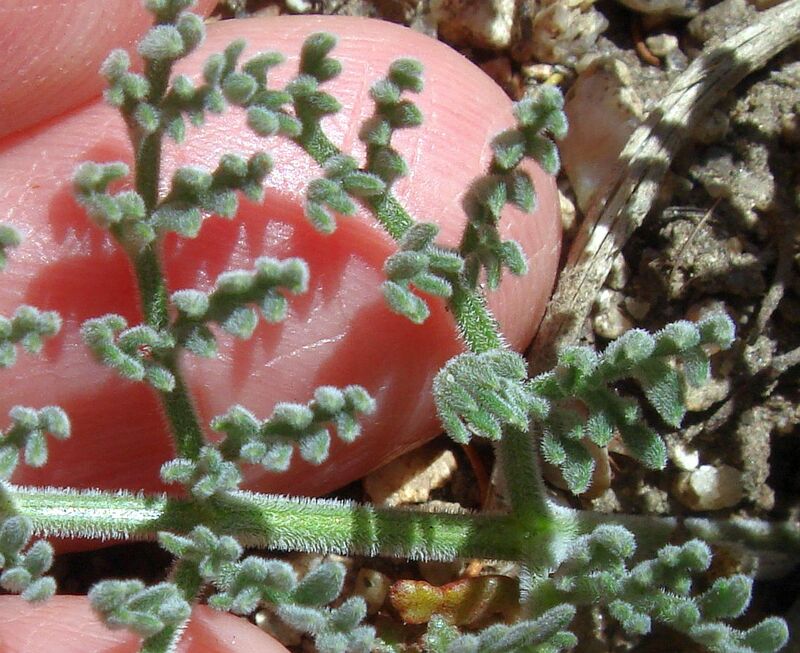 Unfortunately, in the e PR, plants of L. dasycarpum do not have cauline leaves, making the key useless. 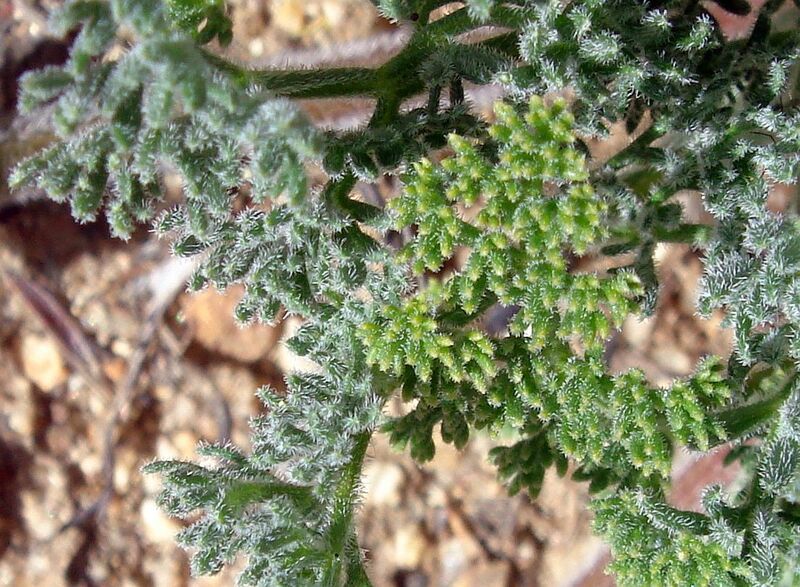 The floras do recognize that L. dasycarpum rarely has zero stem leaves at times, presumably from plants in the e PR. Leaf blade pinnate degree. Although this seems promising as a separating characteristic, at least if one observes either 2 pinnate leaves or 4 pinnate leaves, the density of the leaf divisions make it difficult to determine from photographs exactly how pinnate a leaf blade is. 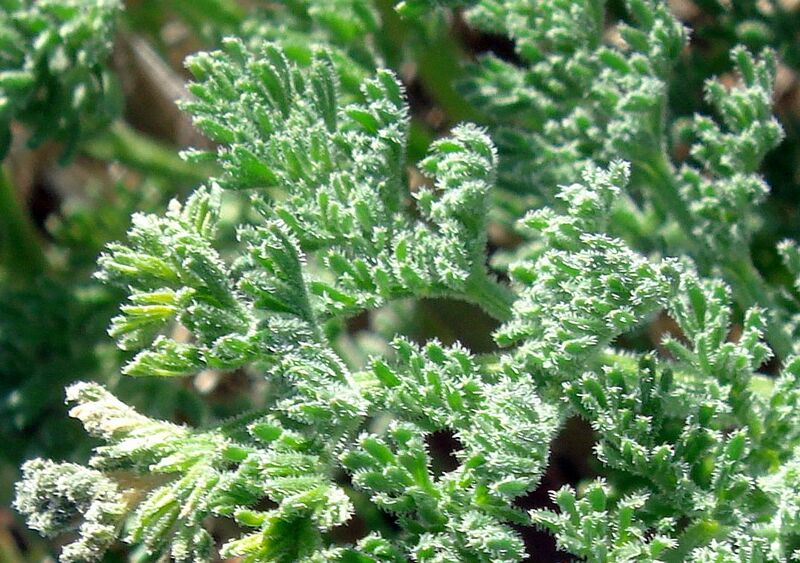 Plants with 3 pinnate leaves can fit either species. More study of this is needed to see how well this can be used. Shape of the ultimate leaf divisions. The floras state that the ultimate leaf divisions for L. dasycarpum are linear, and the ultimate leaf divisions for L. mohavense are linear-oblong to obovate. 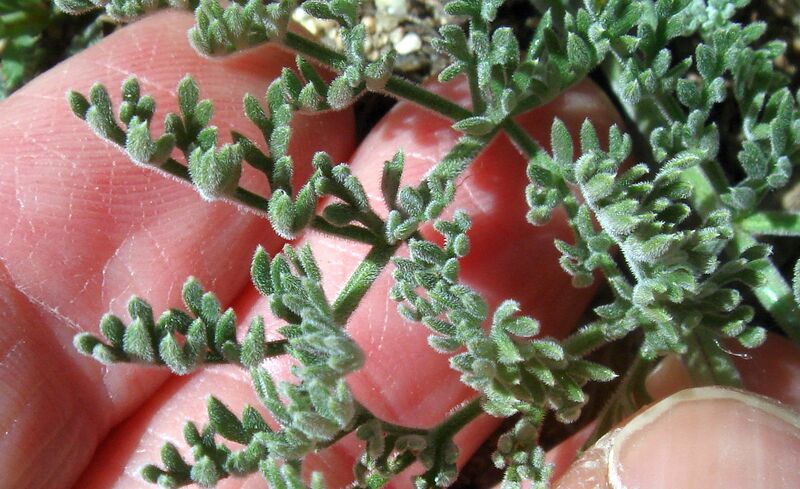 Unfortunately, plants of L. mohavense in the e PR have leaflets indistinguishable in shape from those of L. dasycarpum except when the ultimate leaflets are oblanceolate / obovate. See Fig. 4 for the variation in ultimate leaf shape for these two species. 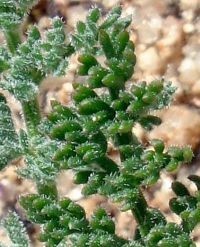 Plants of L. mohavense in southern California may have different ultimate leaf divisions than plants elsewhere since our plants were formerly placed in subspecies longilobum of L. mohavense, which has ultimate leaf divisions oblong to oblong-ovate, usually more than 3 times longer than broad (Munz 1974). Fig. 4. Leftmost two columns: ultimate leaflets of L. dasycarpum. Rightmost two columns: ultimate leaflets of L. mohavense. Click on the pictures for larger versions. 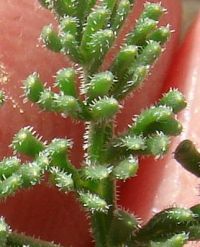 Fruit hairs. 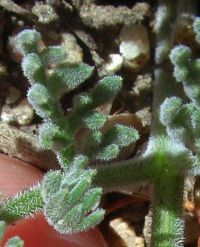 Although L. mohavense has a wider range in density of hairs for its fruit, its fruit in the e PR seems to be nearly identical in hairiness to the fruit of L. dasycarpum; see Fig. 5. 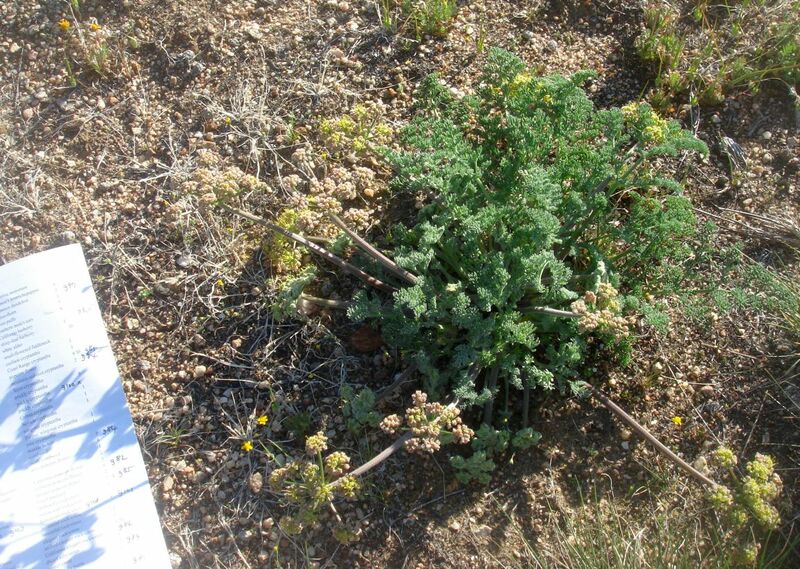 However, I don't have a positive species determination for the L. mohavense plant since no petals were present. That determination is only from vouchers and surrounding plants (see also the discussion below). Fig. 5. 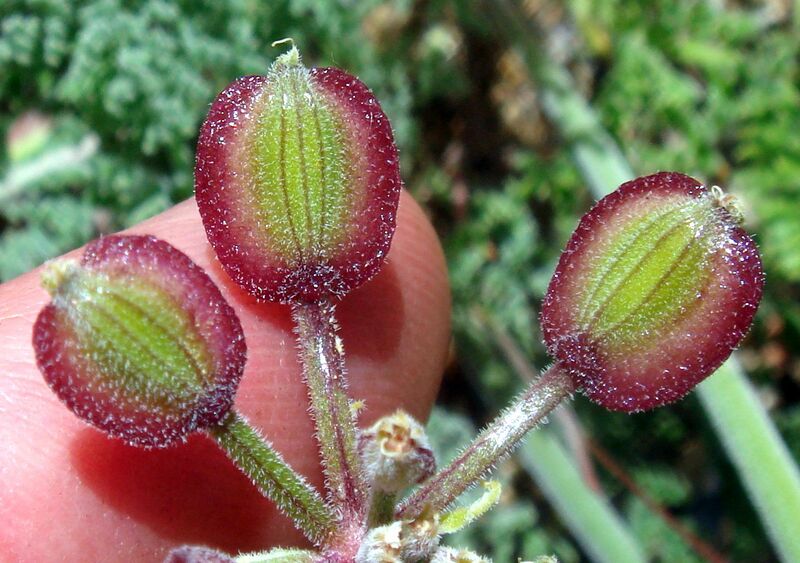 Left: fruit of L. dasycarpum from Cuyamaca Peak 1 June 2013. Right: fruit of L. mohavense from Blair Valley, ABDSP, San Diego County, 10 April 2012 (see note in text about this determination). Click on the pictures for larger versions. 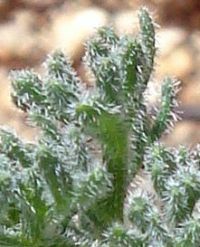 Leaf hairs. Examining the larger pictures linked from the smaller pix shown in Fig. 4 shows that in general the leaf rachis hairs are quite different in density and coverage around the stem. Compare, for example, this pix of L. dasycarpum with this pix of L. mohavense. 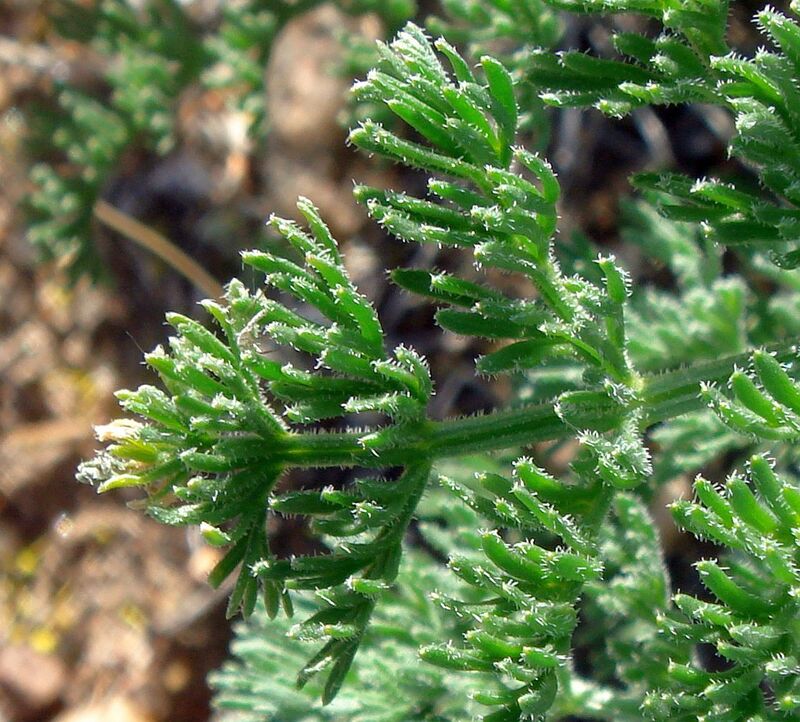 However, this pix of L. dasycarpum shows a density of hairs on the leaf rachis that is similar to that of L. mohavense. 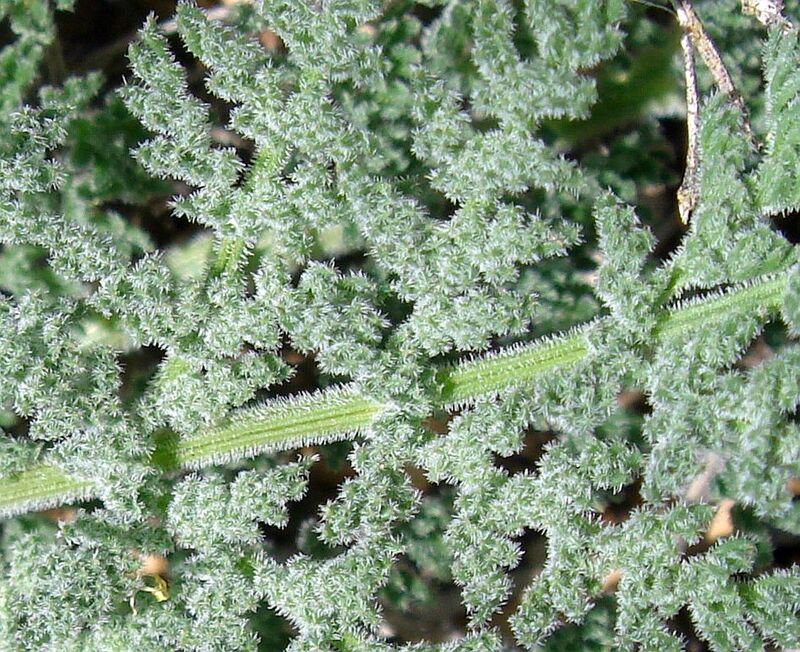 In addition, the ultimate leaf segments have so many hairs that it makes it difficult to ascertain their shape. 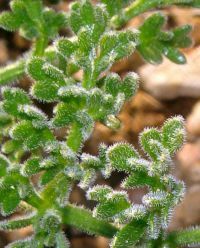 Leaf hairiness can vary dramatically between new and older leaves on a single plant; see this picture of L. dasycarpum. 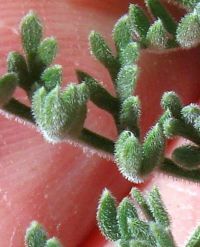 Number and radial symmetry of inflorescences. 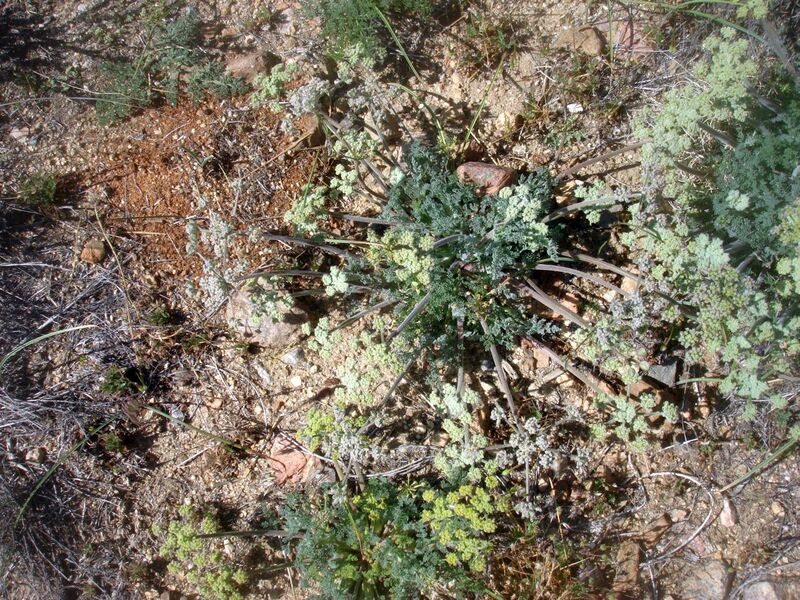 All my pictures of L. mohavense, with the single exception of the Blair Valley plant shown in the bottom row of Fig. 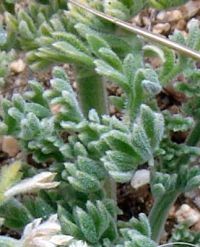 3, support Jordan Zylstra's observation that the inflorescences of L. mohavense are few in number, and hence not radially symmetric. All my pictures of L. dasycarpum do indeed seem to have at least three inflorescences with radial symmetry about the body of the plant. This characteristic seems so reliable that it caused me to question my determination of that Blair Valley plant. Since there are no petals on that plant, there seems to be no unambiguous way to determine it to species. My determination was made from the surrounding plants, which were L. mohavense (see the plant in the first row in Fig. 3), and from vouchers, which do not place L. dasycarpum near this location. However, I cannot rule out that L. dasycarpum could be found at this location, which would be an extension to the east of 10 km from the nearest voucher of that species. 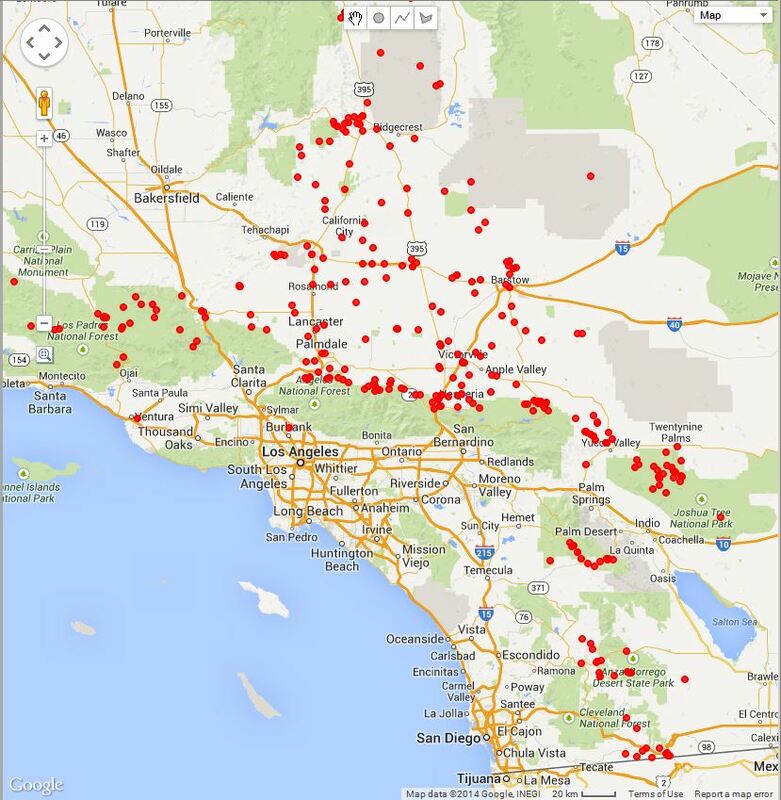 Although this characteristic seems to be fairly reliable, there are exceptions seen in online pictures from areas that are solidly in L. mohavense territory, including from Joshua Tree National Park and Inyo County. Voucher data provided by the participants of the Consortium of California Herbaria (ucjeps.berkeley.edu/consortium/) on 19 April 2014.